Find the perfect fit for your bookmark creation. 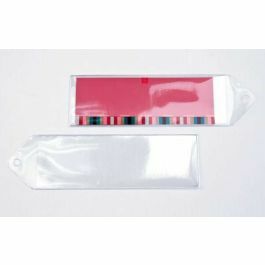 Shorter and wider than the standard bookmark size, our HBM6 Hanging Bookmark Vinyl Sleeve measures 2 5/8" x 4 1/2". Ideal for holding crafted bookmarks, photos, and artwork. Features a hole for a peg display or to attach ribbons/tassels. Whether your bookmark is long or short, we carry multiple sizes to fit your creation. 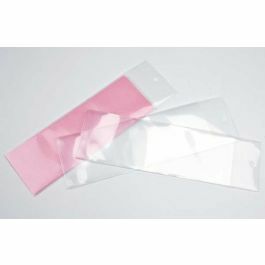 Our HBM6 Hanging Bookmark Vinyl Sleeve has a usable space of 2 5/8" x 4 1/2" and fits a bookmark that is both shorter and wider than the standard bookmark size. 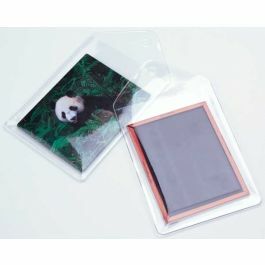 This 7.5 mil thicker vinyl plastic is ideal for holding bookmarks with charms or beads. Insert drawings, cartoon strips, photo strips, and more. A hole is located on the top of this sleeve to attach ribbons and tassels or to hang from a peg display. Bookmarks are shipped in a pack of 100 in sheets of five. Acid-free. 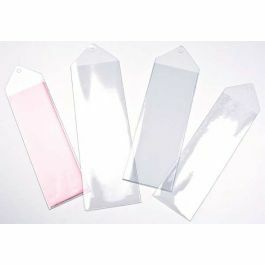 Outer Dimensions: 2 5/8" x 4 1/2"
The primary use for HBM6 is to hold bookmarks that fit up to 2 5/8" x 4 1/2"